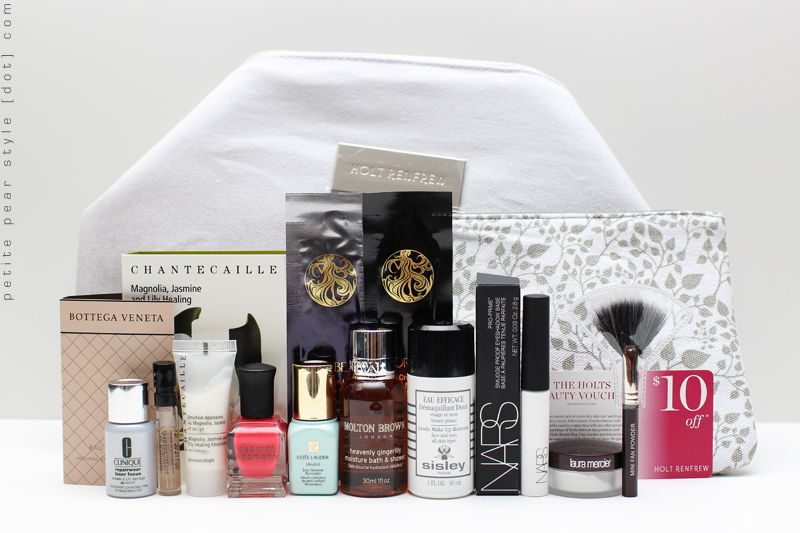 I purchased the Holt Renfrew Spring 2013 Beauty Bag at the Bloor Street location last Friday. Apparently, these bags are released twice a year but I've never seen them before so when I saw this offer posted on the Beauty Box Spoilers page (on Facebook), I knew I wanted to check it out. The bag is priced at $35 plus tax and there are lots of goodies tucked inside! I believe this bag is still available in case anyone is interested in checking it out. If you purchased one of the beauty bags, please let me know what you thought of the samples! Note: I paid for this beauty bag with my own money. wow! is this at all holts or just bloor? Wow! Tempted... Sisley, Chantecaille, Laura Mercier, Deborah Lippman, these are all attractive brands! Wow awesome! I'm going to have to check with the Vancouver Holts. no holts near me :( looks like a great bag though! I'm jealous of the Deborah Lippman polish and Nars primer! i wonder if you can get it shipped to you? i thought i read somewhere that they do that... ?? Let me know how you like that eye primer, ive heard lots of positive things about it, but can never justify paying 30$ for a primer!